Hi there i need the Koken Barber Chair Long Arm Hinge Bracket 505N, and the calf rest 504. if any of you have one let me know. i bought in a koken electric barber chair.i think is 1982 it is lecking hydralek ffluid. i need fix it .i’m in dallas,tx do yoou know some one who is good at fixing something like this. If you have the serial number can you find the date of manufacture. Looking for headrest and hydraulic pump for 1928 Koken barber chair. I have 2 emil barber chairs, they have most of all the parts, porcelain is in good shape. If someone wants it all for one money, I’m open to reasonable offers, just trying to keep from listing everything individually on ebay. I’m in northwest indiana. Hello my name is Daniel and I’m curious to see if you sold these chairs yet. If not you can text me 3127219399 or call. I have a koken jr. barber chair and I’m in need of the 2.5 inch piston. does anyone know where I can find one? I need the part that covers the back where the seat and the back fold to extend the Koken chair. The chair was probably manufactured around the early 70’s . Can you help me? Hi, I have a Koken child’s barber chair and I am looking for the foot rest. Any ideas where I can get one? I have a mint condition Koken barbers chair that has the letters on the foot rest in script not print, can you tell me the year? Is the serial number on the top cover under the cushion? Any help is greatly aprichated . Hello! I have to move two Koken President Barber chairs c. 1950-60. I need an approximate weight or the movers won’t even give me an estimate. I’ve looked at many Koken and antique sites, no info on weight. Anyone??? I think they are 5 to 800 lbs..
Where can I find a repair service for my Koken barber chair? Closest possible to Richmond Virginia? 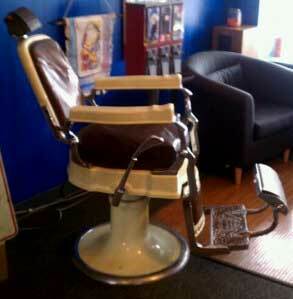 Google barber chair repair locally for your city you will probably find that one of them works on vintage chairs. I am in search for a Koken chair head rest what styles do you all have and year?